Unexpected down time is one of the most resource depleting and aggravating problems we deal with in business. We see compactor and baler breakdowns every day. Many are the result of maintenance items that have gone unattended and/or early warning signals that have gone unnoticed. Every 6 to 12 months is the standard for a professional to provide an inspection of the entire machine. Since the machine is metal with moving parts, it must be checked for signs of metal fatigue. Metal rubbing against metal and must be checked for wear. Often a simple correction can save a considerable amount of money. Similar to an oil change for an automobile, the hydraulic fluid level in a compactor must be changed. There is also a filter in the hydraulic system that should also be changed. It is critical these services are provided every 3 to 12 months depending on the type of machine and the volume of material that it is being compacted or baled. We provide Compactor & Baler Maintenance Contracts for over 300+ types of Portable Compactors, Stationary Compactors, Indoor Compactors, Balers and other equipment across Canada. Preventative Maintenance programs target these items by allowing one of our qualified technicians to service your equipment quarterly, semi-annually or annually, based on the type and volume of material being discarded, along with the age and type of equipment that you are using. Inspection of Electrical Control Panel:Wire condition, tight connections, relays and switches for good contact and proper operation. Safety and Limit Switches:Inspect and adjust. Operation:Warning lights, pressure gauge, key switches and emergency stop. Structure:Physical appearance, wear points, ground anchors, wiper blade and follower plate. Lubrication and Inspection:Door hinges, door handles, paddle latches, turnbuckles, access gates, motor, motor coupling, ram track and guides. Hydraulic System Check:Condition of hoses and fittings, oil level and condition, cylinder shaft wear and leakage. Operating pressure check. Safety Standards:OSHA and ANSI standards, infractions will be noted and remedies quoted on request. Container: Physical condition checking all rollers, door hinges, seals (if possible) and latching mechanisms. Life Expectancy: Date of Manufacture, Charge Chamber wear, and estimated life expectancy of the unit under current operating conditions. 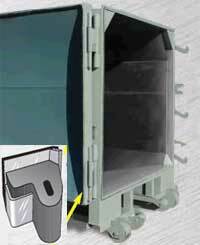 The main large door seal is very important to maintaining the liquid tight feature of your self contained compactor. If this seal is not maintained properly the seal can wear out and become ineffective. When this happens you loose the proper seal and liquid begins to leak out onto the ground attracting vermin and creating unsightly conditions and odors. Compaction Plus offers the following service for door seal inspection and replacements if necessary. This work can be performed on site and if the door seal requires replacement we will quote you the cost prior to any work being performed. The door seal inspection will need to be scheduled immediately after your hauler empties your compactor. This is because the compactor needs to be empty to perform this service. A visual inspection of the container floor will also be performed to check for wear and possible other leakage points. Compaction Plus Inc. reserves the right to apply additional charges if warranted due to restricted access or unusual conditions. Compaction Plus Inc. will always secure approval from the Customer in any situation that requires additional charges. Click on the ADD to CART for immediate service or Contact us by calling our service line at 416-854-9669. You may also use the "Contact" page on our web site. Let us provide the Peace of Mind that comes with our Effective and cost saving programs. The Engineering Department is ably led by a hands on Management team who have an office-based Administration team taking emergency calls, organizing work schedules, emergency cover and arranging services full time. Our Engineers are deployed throughout Ontario and there are Engineers available for calls 24 hours per day 365 days per year. The whole team genuinely believe that every customer of Compaction Plus is a reference site, and care deeply that the compaction & baling equipment is not only serviceable but more importantly that it maintains high compaction ratios throughout its life expectancy. All vehicles are fitted with the latest hands free communications, so that the transport and site management teams are aware of where their assets are, and in contact with them at all times. This enables us to divert the nearest vehicle to cover for breakdowns etc. We also have our own fabrication workshop in that works in conjunction with our Engineers and Drivers, to carry out repairs and refurbishments to all types of skips. All Engineers carry a full complement of tools and spares to ensure that 99% of breakdowns are repaired immediately. Our Engineers are factory trained and have access to technical support from TCG's head office and the factory itself. In the unlikely event that a machine cannot be repaired quickly and excessive downtime will lead to deterioration of service, TCG will arrange for temporary containers until the repairs can be completed. Our team will also assist you if the machines are damaged by the waste contractor, unlikely but not impossible, to claim on the waste contractors insurance. If they are our affiliate waste contractors then we will liaise with them direct after first repairing the machine for you. The majority of call outs are due to the lack of preventative servicing on the compactors. For instance oil leaks if not detected early enough can result in serious damage. Oil leaks also result in decreased ram pressures, which lead to increased collections and significantly increased running costs. Oil leaks can be caused by customers neglecting to clean behind the inspection hatches and amassing waste damaging the rams or hoses, or by the waste contractor being reckless during loading and or unloading. Fortunately these events are few and far between. We are continuously looking for ways to improve our services, and ensure your continued satisfaction. Please contact us with your opinion and comments.